The mornings are a little more crisp, the leaves are tentatively starting to change colour and the evenings are subtly becoming darker. Autumn is coming, can you feel it? Autumn is easing us in slowly this year. Typically in my neck of the woods, one minute you’re finally managing how to work a high waisted floaty maxi skirt & crop top combo and the next you’re plunged into the deepest darkest recesses of Winter in 1 fell swoop. Given the summer we’ve had I’m grateful this hasn’t been the case but I’m ready now. I have my brand new belted Mac, I’m lusting over cosy Zara knitwear and I’m physically and mentally prepared for the gorging / hibernation to take place. However, like a marathon, we’ve really got to start things off slowly because we’ve got a long slog ahead of us. I like to kick things off with apples. It’s a good place to start. They’re in season, they’re crisp and fresh, they remind me of Halloween and they’re cheap. Nuff said really. Even better, most baking which includes apples in some shape or form can also double as pudding and we all know that pudding in Autumn requires custard, ice cream or both. Don’t fight it. 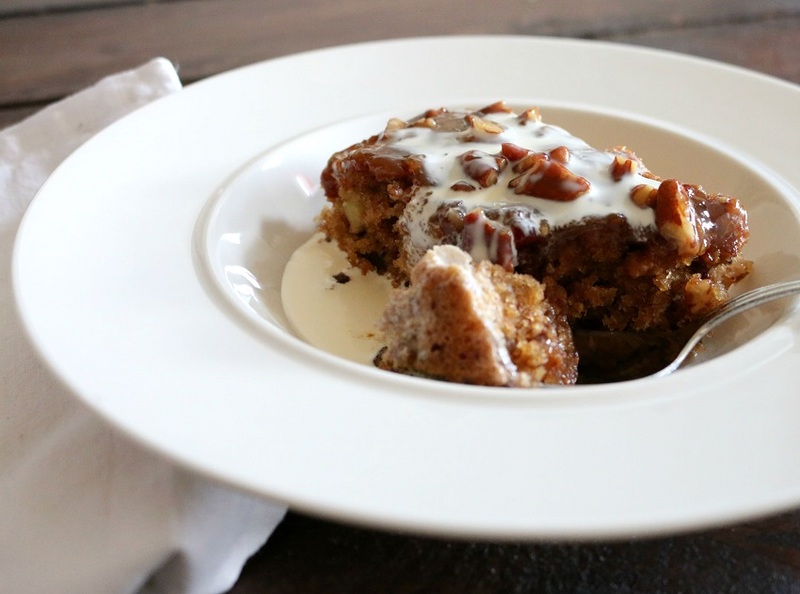 This Autumnal offering is a cross between a Banana Bread (without the banana) and a Sticky Toffee Pudding in terms of flavour and versatility. So, you have a cake which can double as a pudding. Meaning you can justifiably have a slice mid-afternoon with a cuppa and another warmed up slice, drenched in custard, for pudding later in the evening. This is the kind of versatility we need more of in baking. This recipe comes from the September 2014 edition of BBCs Good Food magazine which is essentially the ‘ease yourself into Autumn’ edition. Mercifully they didn’t plunge us straight into chutneying, preserving and Christmas prep all in a one’er. Instead they take the slow and seasonal route by kicking things off with fruit and baking. Given that this was the first time I made this cake I didn’t tinker with the recipe but I will going forward. The chunks of apple were a little unappealing. They didn’t cook as well in the batter & still retained a crunch I wasn’t thankful for. If you grate the apples instead they will melt into the sponge during cooking and keep the cake moist for longer. Also this really could have done with a splash of vanilla essence or vanilla sugar to bring out the flavours. That said, the method of soaking the dates was inspired and really helped retain the moist softness of the cake, meaning it could stand up to a few more days in the cake tin. A cake which can see you through the week is something we can all do with when easing ourselves into Autumn. A slice of Autumn to ease yourself in. You can make this cake in a Bundt Tin or, as I did, in a rectangular tin measuring approx 23cm x 33cm. If you are using the Bundt Tin then grease it liberally with butter. Sprinkle a little flour inside the tin & tap it firmly to spread the flour all around the inside of the cake tin. Shake away the excess over the sink. If you are using a rectangular tin then grease with butter & line with greaseproof paper. Set the tin aside until ready to use. If the dates are un-stoned, slice them down the middle & remove the stone. 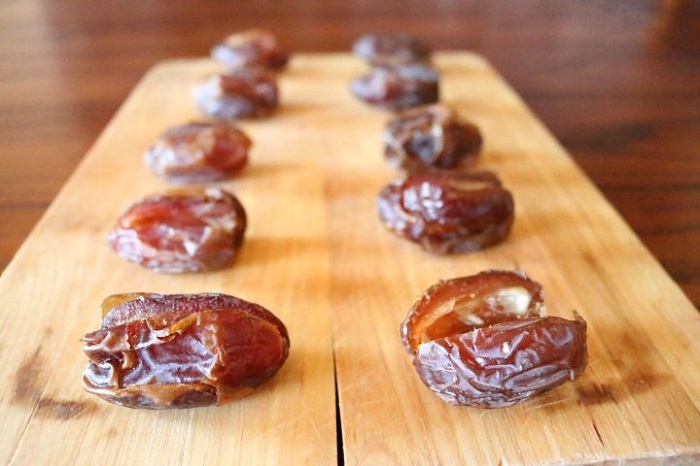 Place the dates into a bowl & cover with hot water from the kettle. Leave to soak for 15 mins. Meanwhile prepare the remaining ingredients. Roughly chop the pecan nuts. Peel and core the apples then grate them. 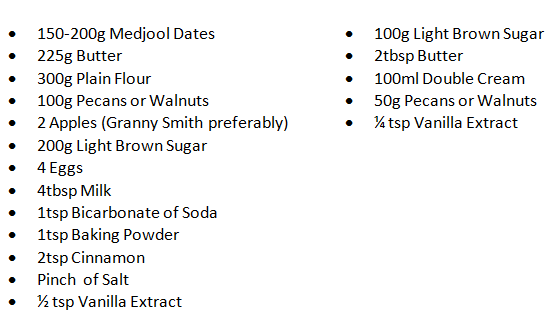 Measure out the flour, bicarb of soda, baking powder, salt & cinnamon. Now drain the dates and chop them finely (Don’t be alarmed if they turn to mush, this is supposed to happen. 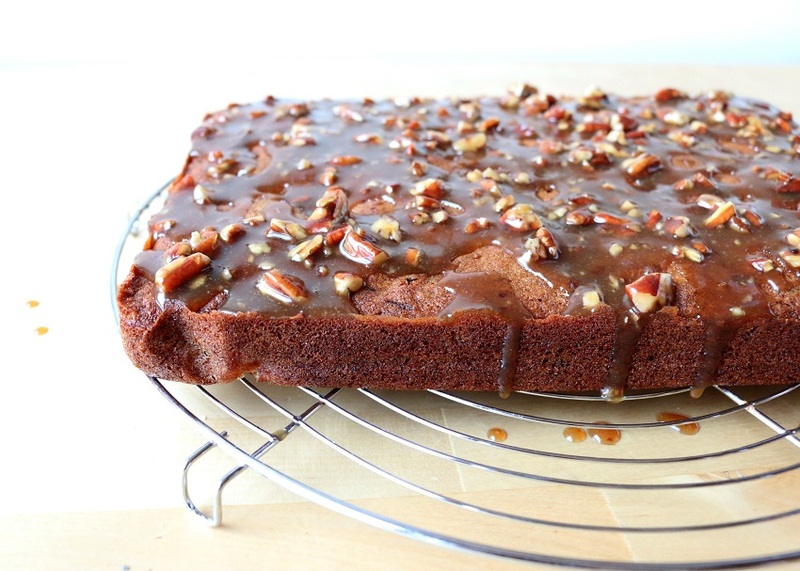 The dates will combine with the cake batter to create a smooth batter). Using a free-standing mixer, electric handheld whisk or a wooden spoon, beat the sugar and butter together until combined & smooth. Cream the butter & sugar until combined and smooth. Add the eggs and milk. Then sift the pre-weighed flour, bicarb of soda, baking powder, cinnamon and salt into the batter. 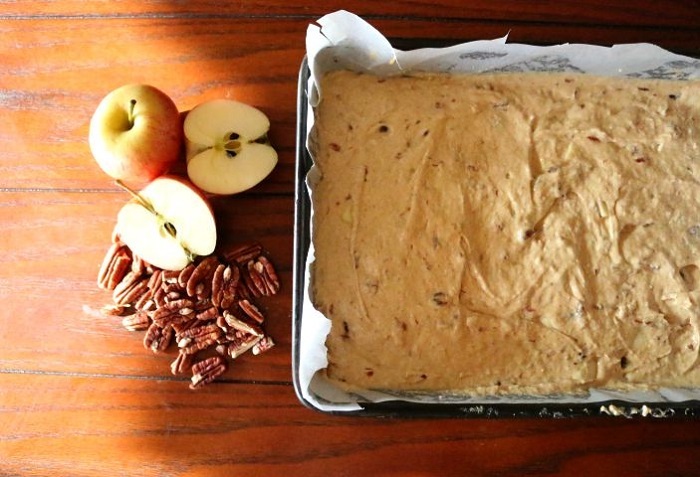 Tip the apples, dates and nuts into the cake batter and mix together until combined. 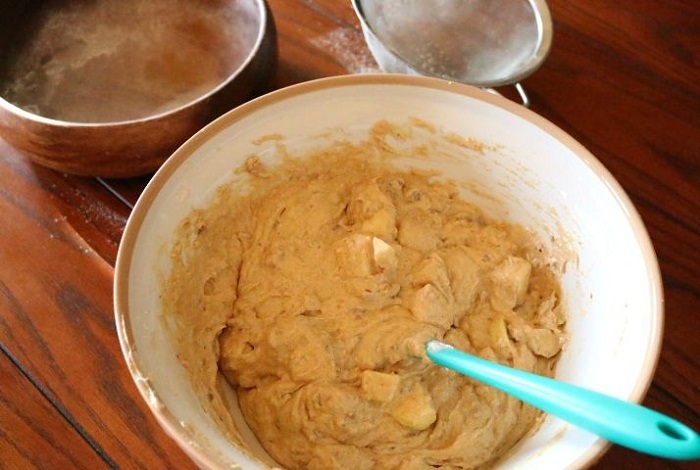 Scrape the batter into the cake tin and smooth the top with the spatula or spoon. Bake for 50 mins until golden. Check the cake after 40-45 mins by inserting a cake tester or skewer into the middle. If it comes out clean the cake is ready so remove it from the oven. If the skewer has a little cake batter on it, cook for a further 5-10 mins and test again. Leave to stand to cool or serve warm. 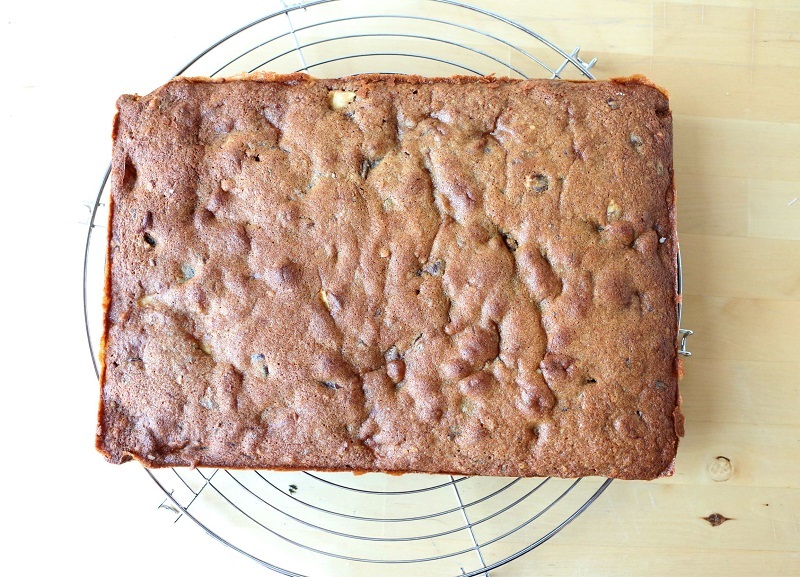 Remove the cake from the oven & leave to stand on a cooling rack for 10 mins. Remove the cake from the tin and either leave to cool or serve warm. Make the toffee sauce by melting the sugar, butter and cream in a pot over a low heat. Once the ingredients have combined, simmer for 3-5 mins. Meanwhile, chop the pecans (large or small chunks, whichever you prefer) and stir into the sauce. Leave the sauce to stand for 10 mins, off the heat, before pouring over the cake. Generously pour the toffee sauce over the cake. 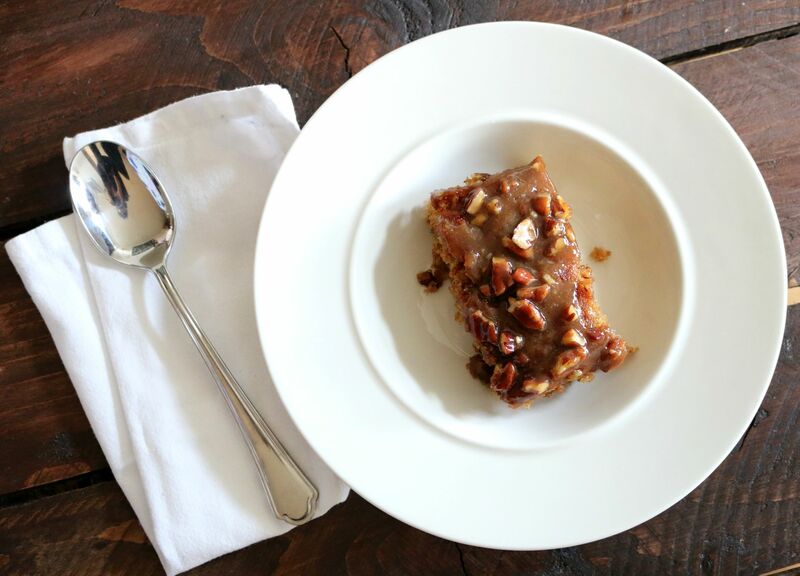 If you’re serving the cake cold, leave the cake to set for 20-30 mins before cutting into slices. Drench in cream & prepare for the hibernation ahead. Replace the milk with Almond milk. Replace the eggs with 1 Cup Soy Yoghurt or 1 Cup Mashed Banana. 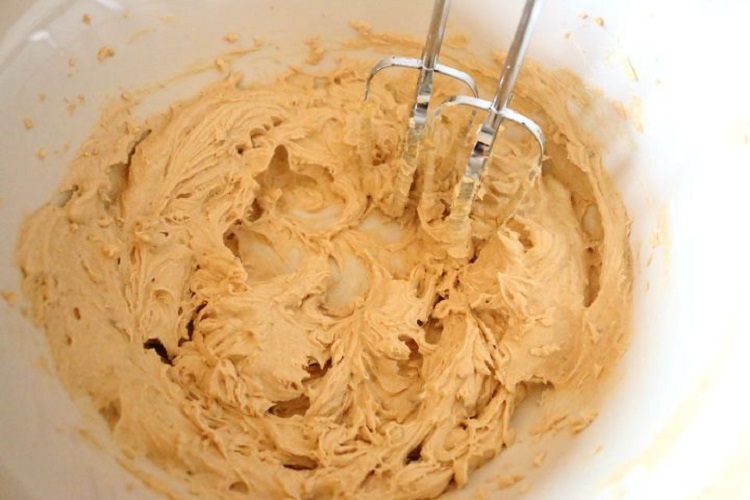 Replace the butter with equal quantities Margarine or Olive Oil or Canola Oil.